The dugout was raucous. The chants were ear-splitting. Freshman Kristina Mueller was in scoring position. Sophomore Nicole Paiotti was in the batter’s box. “I see a gap, and Nic is going shopping,” 20-plus Rowan players hollered in unison, rattling Ramapo’s Erin Fitzsimmons on the mound, and igniting Paiotti. Right on cue, Paiotti went shopping. The sophomore tattooed a 1-0 offering from Fitzsimmons up the middle, scoring Mueller and forcing the mercy rule — their fourth such game in six conference contests. The Rowan softball team shut out visiting Ramapo College, 8-0, and would then sweep the doubleheader Monday with a 1-0 win in the closing game. 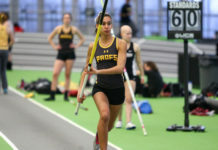 The Profs (22-6, 5-1 NJAC) are now in the thick of New Jersey Athletic Conference action. Their most recent conference foe, Ramapo, came to Glassboro with a bullseye on its back. The two programs met up in the NJAC Championship game on May 3 of last year. Ramapo left town with the trophy after a commanding, 8-2 victory. This time, the brown and gold were seeking some retribution. “I really wanted to go out and show them that we mean business and we’re not going to let them roll over us like they did in the NJAC [Championship],” senior pitcher Beth Ann Hyland said. Hyland, who has been placed on the National Fastpitch Coaches Association/Schutt Sports Division III National Player of the Year watch list, picked up her 11th and 12th wins, completely nullifying the Roadrunner bats in both games of the doubleheader. The senior went four innings in the front end before giving way to senior Allison Nolan to close it out. She then tossed a seven-inning shutout in the second game. Hyland usually only throws the first game of a doubleheader, while the second features a combined effort from the staff. This time, Wilson wanted her ace in the circle for both. 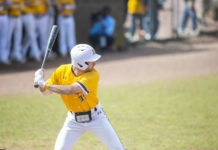 The second game with Ramapo was a rarity for the Profs in terms of run differential, but it provided vital experience to the the underclassmen who have not been exposed to tight-game situations.